Rich, fudgy, triple chocolate flourless brownies made with dark chocolate and filled with milk chocolate chips and semi-sweet chocolate chunks. For an extra layer of indulgence, this gluten free dessert is covered in a homemade salted caramel sauce and sprinkled with flaky sea salt! Well, isn’t this ironic? A flourless brownie recipe here on Flour Covered Apron. I know, I know. IT DOESN’T MAKE ANY SENSE. But bear with me here, because these are some of the richest, fudgiest brownies you’ll ever have and I just have to tell you about them! Actually, it just so happens that my February recipes are turning into a little mini-series on gluten free baking. I didn’t exactly plan for it, but there are some people in my life that I love who are on gluten free diets for a variety of reasons and I love to bake for them too! This particular triple chocolate flourless brownie recipe came about while I was baking for a recent family get-together. Halfway through putting together one of my usual peanut-buttery (and floury) desserts, I realized that not only would we have a nut-free family member in attendance, but that there would also be a gluten free guest! It was really important to me to make something that we could all enjoy together, so I had to think fast. I ended up deciding to make these triple chocolate flourless brownies with a salted caramel sauce on top to make them extra indulgent. ‘Cause that’s just how I roll. The flourless brownies are adapted from Running with Spoons’ flourless double chocolate brownie recipe. Since I never say no to more chocolate, I used both melted dark chocolate and dark chocolate cocoa powder in the batter, then mixed in some milk chocolate chips and semi-sweet chocolate chunks (over the weekend, I found out I had approximately 19 half-used bags of chocolate chips in my kitchen cabinet, and this recipe was the perfect way to put some of them to good use!). 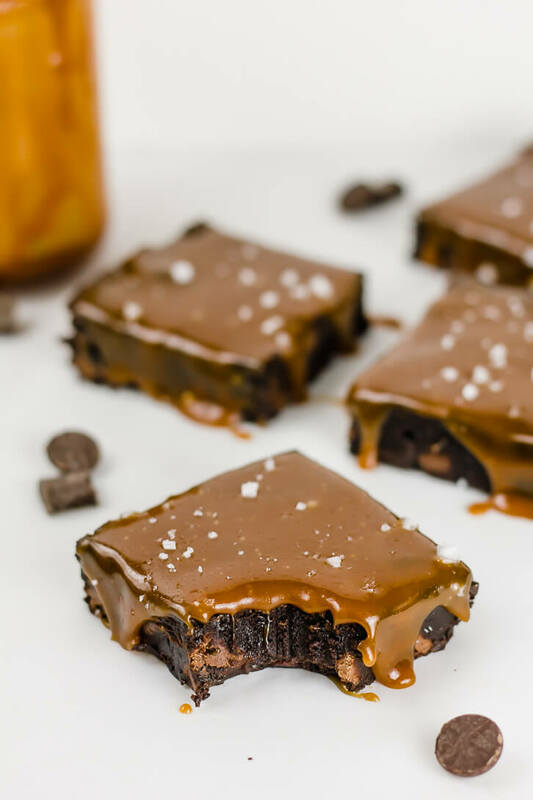 After the brownies are baked, my favorite homemade caramel sauce gets poured right on top of the brownies, and then they’re given a generous sprinkling of flaky sea salt. Because what would caramel be without sea salt?? Match made in heaven. In the end, I’m pretty sure everyone at our get-together actually enjoyed these flourless brownies better than the other dessert I had made, so it turned out to be an absolute win-win! Stay tuned for my latest layer cake recipe (made with gluten free flour) next week! And in the meantime, if you make these triple chocolate flourless brownies, don’t forget to take a pic and tag @flourcoveredapron on Instagram! Rich, fudgy, dark chocolate flourless brownies filled with milk chocolate chips and semi-sweet chocolate chunks. For extra indulgence, this gluten free dessert is covered with homemade caramel sauce and sprinkled with flaky sea salt. Preheat the oven to 350 degrees and prepare an 8x8 inch baking pan by lining it with parchment paper and greasing it generously. Stirring frequently, heat the dark chocolate and butter in a small saucepan over low heat until both are melted completely. Let cool for a few minutes. Using an electric mixer, beat together the eggs, sugar, and vanilla extract for about 2 minutes until completely incorporated and smooth. Pour in the chocolate and butter mixture and beat to combine. With the mixer on low speed, add the cocoa powder, cornstarch, and salt. Mix until incorporated and batter is completely smooth. Fold in the chocolate chips and chocolate chunks. Pour into the prepared pan and smooth the top with a spatula. Bake for 25-30 minutes, until set in the middle (if you test with a toothpick, it should not be totally clean for fudgy brownies). Let cool in pan for 15 minutes, then use the parchment paper to lift the brownies out of the pan and on to a wire rack. Let cool completely. Over medium heat, melt the sugar in a medium-sized saucepan. Stir frequently with a wooden spoon until the sugar is completely melted (it will begin to clump together then melt into an amber-colored liquid). Reduce heat to low and add butter (the melted sugar may bubble and splatter when the butter is added, this is okay). Continuing stirring until the butter is melted and incorporated completely with the melted sugar. Remove the caramel from the heat and stir in the vanilla extract and salt. Pour into a heatproof jar or bowl and let cool until only slightly warm (should still be pourable). Pour the caramel sauce over the brownies, using the back of a spoon to very gently spread or smooth it out as necessary. Sprinkle with flaky sea salt, then slice into bars. This recipe is adapted from Running with Spoons’ Flourless Double Chocolate Brownies. Made these today for a friend and wow are these brownies good! You can’t even tell they’re gluten-free. Amazing. Also, I was really worried about the caramel making portion of this recipe (thanks for the heads up on splattering! ), but it turned out well. I didn’t make a huge mess and I ended up with a nice and smooth caramel sauce. Yay! Thank you for the recipe! Hi Ana, I’m so glad to hear that you loved these brownies! And congrats on a delicious caramel sauce. I have the fondest memories of my first ever successful batch of caramel. Doesn’t it make you feel so proud of yourself? !